This C. japonica chance seedling first bloomed in 1971. 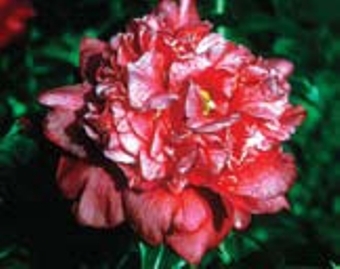 The 4 x 2" dark red peony flower has unique color with red and white petaloids, shows consistent for, is long lasting and suitable for exhibition. Plant is upright with vigorous growth rate and is suitable for landscape. Dark green leaves, 4" x 2".